Q: On May 14, the US Embassy in Israel was relocated from Tel Aviv to Jerusalem. On that day, tens of thousands of Palestinians held protests and demonstrations in the Gaza Strip, close to the Israeli border. They clashed with the Israeli armed police, which ended in killing over 50 people and injuring more than 2,000 others. What is your comment? A: China is deeply concerned about the heavy casualties caused by the violent conflict in the Gaza Strip and opposes the violence targeting civilians. We call on the Palestinians and Israelis, especially the Israeli side, to exercise restraint and avoid further escalation of the situation. The status and ownership of Jerusalem is a highly complex and sensitive issue which is at the core of the Palestinian-Israeli dispute and involves national and religious feelings. 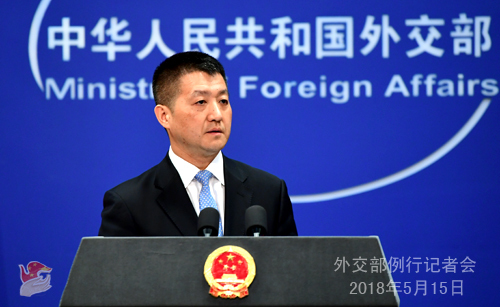 China always believes that the issue of the final status of Jerusalem should be resolved through dialogue in accordance with the relevant UN resolutions and by resuming the Palestinian-Israeli peace talks at an early date. We firmly support the just cause of the Palestinian people to restore their legitimate national rights and stand behind efforts based on the two-state solution to establish an independent State of Palestine that enjoys full sovereignty with East Jerusalem as its capital and based on the 1967 border through Palestinian-Israeli talks. 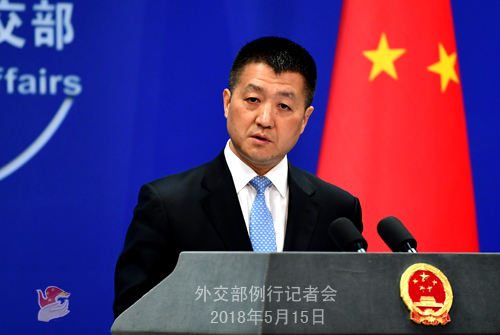 China stands ready to join hands with relevant parties of the international community and work for the final proper settlement of the Palestinian issue. Q: It is reported that a Chinese delegation will participate in the Saint Petersburg International Economic Forum which will be held from May 24 to 26 in Russia. Can you confirm it? If so, who will lead the delegation and who are the participating members and enterprises? A: The St. Petersburg International Economic Forum is one of the world-renowned economic forums for discussions on international economic and financial situations. 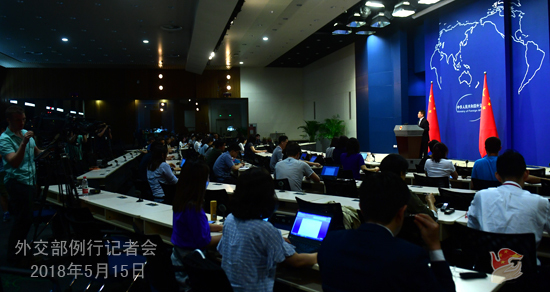 China has been sending high-level delegations to attend this forum annually in recent years. We believe that this forum also plays an important role in promoting China-Russia practical cooperation in the economic, trade and investment sectors. We are now definitely considering sending a high-level delegation to attend this year's forum. Q: According to reports from the DPRK side, a friendship visiting group of the Workers' Party of Korea (WPK) arrived in China yesterday. Could you give us more details on the purpose and schedule of their visit? It is also reported that the DPRK traded its denuclearization for China's phased economic aid. What is your position? A: Regarding your first question, at the invitation of the International Department of the CPC Central Committee, a group of the WPK officials commenced a friendship visit to China on May 14, as a concrete step to implement the important consensus reached between General Secretary Xi Jinping and Chairman Kim Jong Un. The visiting group will make some tours to learn about China's achievements in economic development and reform and opening-up and promote an exchange of views between the WPK and the CPC on state governance. Regarding your second question, we have released the press readout for the Dalian meeting between General Secretary Xi Jinping and Chairman Kim Jong Un which details the perspectives and important consensus of the top leaders of the two parties and two states on China-DPRK relations and the Korean Peninsula situation. May I suggest you read it carefully? Q: Yesterday, officials from Pakistan and Afghanistan held a meeting in Islamabad and they agreed to actively implement the Afghanistan-Pakistan Action Plan for Peace and Solidarity (APAPPS) towards eliminating terrorism and achieving peace and stability. What is China's comment? A: We have taken note of relevant reports. China highly commends and firmly supports this development. We believe that it will help create an enabling environment for the realization of peace in Afghanistan at an early date and contribute to the joint efforts to uphold peace and development of the two countries as well as the whole region. As a neighbor and friend to both Afghanistan and Pakistan, China is willing to continue with its constructive role in improving the Afghanistan-Pakistan relations and actively advancing China-Afghanistan-Pakistan trilateral cooperation. Q: A question again on the casualties following the Palestinian-Israeli conflict. When the spokesperson of the US State Department was questioned, they suggested it was the fault of Hamas. What is China's position on this? A: Just now I have expounded on China's position on the recent violent conflict in the Gaza Strip. This violent conflict has become the deadliest in that area over the past few years, especially in terms of heavy civilian casualties. The Chinese government is gravely concerned about the situation and we are opposed to violent activities targeting civilians. Under the current circumstances, we believe that all relevant parties, the Israeli side in particular, should exercise restraint, prevent the situation from further escalation, and avoid causing greater turmoil or casualties. This is the pressing task at the moment. The current situation, as is well known by the international community, is a fallout of the dispute regarding Jerusalem's status. Just now I have also expounded on China's position on that as well as China's proposition on the final settlement of the Israeli-Palestinian issue. Q: A recent report by the Harvard University researchers said that China seeks to gain strategic advantage by offering loans to 16 developing countries in the Asia Pacific. What is your response? A: We usually make no comments on academic reports, and I am not sure whether the opinion you cited is the main idea of this report or very representative of this report. If so, then I have to say it is a highly irresponsible accusation. In other words, this report is written by those who are stuck in their habitual mindset to speculate on the considerations and positions of the Chinese government's foreign aid and cooperation. When China cooperates with others, including in the economic and financial fields, it follows the principle of shared benefits through consultation and contribution, mutual respect and win-win results. As for how such cooperation translates into concrete results, the governments of our cooperative partners and their peoples are in the best position to say. The third party you mentioned had better stop gauging, based on their own mindset, what other people may think. They are so wrong to believe that South-South cooperation between China and other developing countries harbors ulterior political motives that they are get used to. Q: GAP has apologized for publishing this incomplete map of China on one of its T-shirts. What is your comment? Has the Chinese government made a complaint to the company? Or is it simply a reaction to what Chinese consumers are saying? A: I have noted from press reports that GAP Inc. has already issued an apology, saying that it respects China's sovereignty and territorial integrity and that an internal inspection is underway to correct the relevant mistake as soon as possible. The statement also mentioned that GAP Inc. strictly follows Chinese laws and regulations and rigorous reviews will be put in place to avoid similar mistakes. We have noted what they said in this statement, and we will continue to follow how it acts.